Advanced Mode on the DE1+ is perhaps the deepest rabbit hole into which any barista can climb. I generally recommend baristas master the machine in the more familiar Pressure Mode first, and then get comfortable with Flow Mode before using Advanced Mode. Once I dove into Advanced Mode, no other mode or espresso machine could ever satisfy. The possibilities are endless. Advanced Mode on the DE1+ allows the barista to customize a recipe in any way he or she desires. 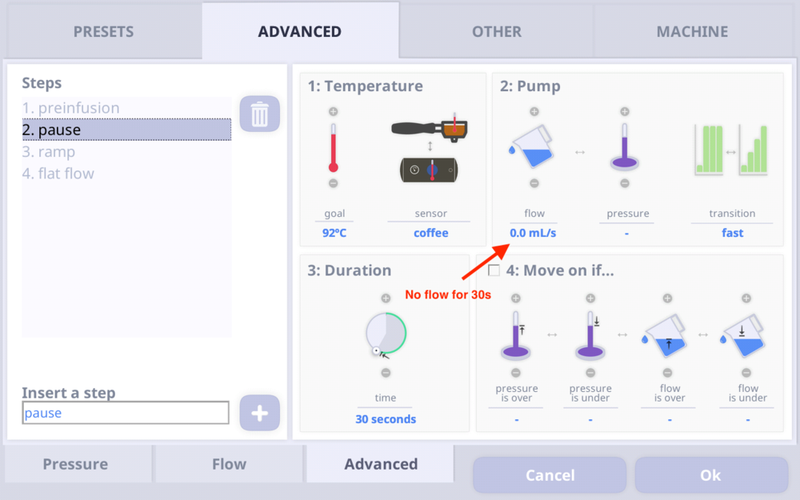 Would you like to preinfuse with a set flow rate, switch to controlling the shot based on pressure, and then switch back to flow mode? No problem. 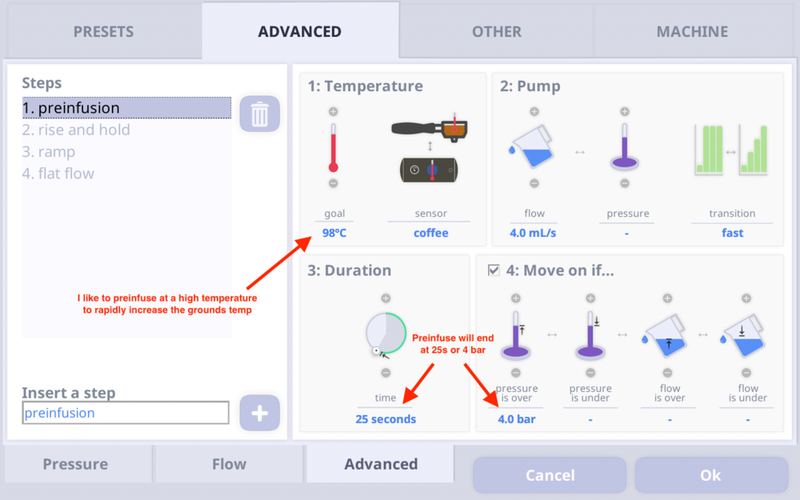 If you want to then use a different brewing temperature for each stage, that’s easy. 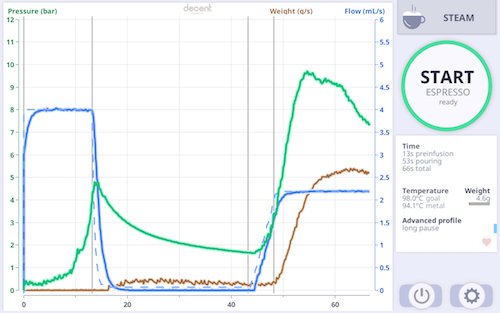 You can set “triggers” that tell the machine to move from one phase to the next based on pressure, water volume, or time. Advanced Mode is incredibly versatile, and it’s much easier to use than I had expected when John first told me about it. Recipes can be as simple or as complex as you would like. Below are the recipe screens from a recent shot I made at home, ground in a Baratza Forté. Extraction (with 0 for VST presets--as always--for those keeping score at home) was 24% (the default presets likely would have brought that up to 24.5%), and TDS was 8.5%. The beans were four weeks old, which boosted extraction a bit. The final screen is the resulting curve. Take it in slowly. It's not complicated, but having so many new data points to look at can be daunting for a moment.